World Boxing Organization Light Flyweight World Champion Tito Acosta will showcase his vast skills June 16 in his first title defense against Nicaraguan challenger Carlos “Chocorroncito” Buitrago in the “La Batalla” 12-round main event, airing on pay-per-view, live from the Coliseo de Puerto Rico Center in Hato Rey, Puerto Rico. 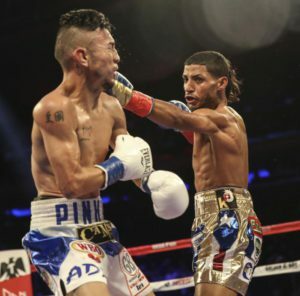 Building his own legacy in a traditionally rich, hot-bed for boxing like Puerto Rico, Acosta (17-1, 17 KOs) captured the vacant WBO title last December at famed Madison Square Garden, when he knocked out Juan Alejo (24-4-1), of Mexico, in the 10th round. An outstanding amateur boxer with more than 180 matches, highlighted by his gold-medal performance at the Central American Games,), the San Juan-based fighter has defeated 22-5 Juan Guzman (KO1), 12-1 Japhet Uutoni (TKO12), and 28-5-3 Luis Ceja (KO2). WBA #2-rated Buitrago (30-3-1, 17 KOs) will be fighting in his fifth world title fight, after losing three times with one draw. He was stopped for the first time in his last fight this past December, by undefeated International Boxing Federation (IBF) Minimumweight World Champion Hiroto Kyoguchi (8-0), in the eighth round of their title fight in Japan. All three of Buitrago’s career losses have been to world champions, including a pair to Thammanooon Niyomtrong (11-0) in 2016 and 2014, both by way of 12-round unanimous decisions in Thailand for the Interim WBA title. Buitrago also fought a 12-round split draw in 2013 to then-WBO Minimum World Champion Merlito Sabillo (12-0) in Manila, Philippines. “Chris Buitrago is a great fighter and tough challenger, who has the highest level of experience, and that motivates me,” Acosta spoke about his Nicaraguan opponent. “People want to watch a toe-to-toe brawl and he brings that style. I think he will brawl with me, but I’ll be ready for any style he brings June 16th.